Visit the Blog - Subscribe to the Podcast! First, be grateful that God has allowed you to see the Biblical Plan of Salvation. If you have arrived at the conclusion that you have been wrong about the plan of salvation, that's good news, not bad news. You have an amazing future ahead! So, what should you do now? A truly sincere heart, the heart of a child, sees this as an opportunity to learn and grow. If you thought you had previously been saved by saying a prayer or accepting Christ, like I did, that should have no bearing on your decision to actually obey the Gospel for the very first time, now that you know the truth. I can't imagine God being angry because you did not know these things or even rejected them because you did not understand. God knows you didn't have this information in the past and has obviously just graciously given it to you. He also knows you have it now! God has very patiently brought you to a point in your spiritual journey where you may now obey. Being wrong in the past does not mean you lose anything. You have a treasure chest of experiences and knowledge with which you will be able to help people, nobody else could reach. Obey the Gospel and you will be a position to help so many people who need to hear this truth. Join the fight against Satan's ruse. There are hundreds of churches teaching the correct plan of salvation. Contact me and I will help you find one in your area. Whoa. Wait... I guess I better back up a second. which has been mishandling your eternal destiny, right? Yeah! This is a huge issue. You may have years of relationships and be very comfortable with those familiar surroundings. I did tell you, there would be radical new changes coming in your life. Changing churches is a huge one! But, honestly, it's nothing new. Jesus dealt with this same issue. Remember, His ministry was directed, almost exclusively, to some of the most religious, sanctified, holy people in the world. These devout, sincere Jews had been following what their spiritual leaders taught them, and they followed to the best of their ability. Look what Jesus told them about their "church," after the leaders were upset by one of His sermons. Matthew 15:12-14 Then the disciples came to him and asked, "Do you know that the Pharisees were offended when they heard this?" He replied, "Every plant that my heavenly Father has not planted will be pulled up by the roots. Leave them; they are blind guides. If a blind man leads a blind man, both will fall into a pit." Wow. That's pretty straight forward. Jesus says, "Leave them." But then, what were these religious refugees supposed to do after that? Well, don't forget there is another side of the coin. Jesus also ofter said, "Follow me." Here's a great scripture about Jesus calling people out of their empty, ineffective religion. I'll bet you know the passage, but not for this reason. This is another one of those famous passages which get pulled out of context all the time and finds itself pasted to the bathroom mirror or refrigerator. Jesus is not talking about the burdens of life like a soul sucking career or a difficult marriage. He's not talking about people over worked and tired. He is talking about the burdens imposed by an empty apostate religion. The sincere worshipers of Jesus day were so loaded down with Jewish rules and regulations, which had absolutely no Biblical authority, it was oppressive and wearisome! This ineffective religious system was leaving people empty and lost sometimes even destitute and devistated. When people follow Jesus, they find rest for their souls! And why do they find rest for their souls? Because their sins are gone! If we are truly going to follow Jesus, it will mean making changes which will affect other parts of your life like joining a discipling church. Take a deep breath. Buck it up and begin acting like a disciple. But before you ever decide to leave your existing church, I urge you to develop a good relationship with someone who understands the Biblical Plan of Salvation and what it means to be a disciple. Contact the person who invited you to watch these lessons. If you can't do that, you really should find someone in a church near you who is willing to disciple you and help you navigate this path with courage and grace. Don't just up and leave a church without a spiritual support system in place. Ultimately, because you love people, I think you should explain to your friends, family and church leaders why you are leaving. That can be pretty challenging and it would be great if you could talk to people who have been through this themselves. so they can better understand your thinking and your reasons for leaving. Perhaps you'll bring along some really great friends and maybe even an entire congregation. Congregational conversions do happen! Whole churches have been know to give up their traditional beliefs and become disciples. As a result of the things you have learned in this series, a truly humble student should do what the scriptures call them to do. There is no separate, special instructions adjusted for the religious experiences we have had in the past. The command still echoes from Acts chapter 2, "Repent and be baptized everyone of you..." Don't forget, even the deeply religious people of Peter's day had to obey Peter's prescription... a certain brilliant, deeply devout, super zealous Pharisee comes to mind as a great example. How are you feeling? Are you ready to learn more? If you still have doubts and you took the survey at the beginning of this series... now would be the time to grab it for review. That survey was designed to show you what you believed, before you saw the Biblical Plan of Salvation... before you heard all the information we have presented here. Look at your responses. Did you check anything that would indicate you believed the forgiveness of sins occurred sometime before obedience? That may help you determine where you currently stand spiritually. I have presented the Biblical Plan of Salvation to many people over the years. Experience tells me that right now is a pretty delicate time for you in your spiritual walk. One of Satan's greatest tricks, is to get you to lean heavily on your spiritual resume and use that history as some sort of validation that you just could not be wrong. Be very careful. If you are referencing the experiences of your past as a defense, that's a dangerous road. If you are a church leader, responsible for the souls of your flock, and have come to understand and accept the Biblical Plan of Salvation, don't just go off teaching this as some new method or philosophy. The presentation of this material must be done with great patience and careful instruction. Please contact someone with experience to help you gently prepare folks for an amazing change. These are really heavy things to consider. But don't sit and ponder them alone for very long. Do not be a lone wolf. It has always been God's plan that one person teaches another person. The church is about relationships, not information. There are many wonderful churches that have these doctrines on straight. While they might differ on some secondary issues, the plan of salvation is solid and matches the pattern of the new testament plan, established in parchment two thousand years ago. Obedience is an act of faith. 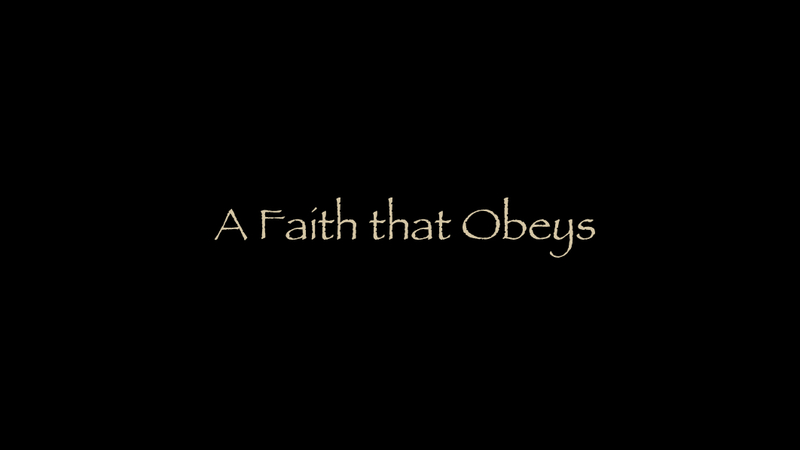 In fact, Romans 1:5 says "obedience comes from faith." So, if we have incomplete obedience, how can we possibly have a complete faith? Contact the person who invited you to watch this series. If you arrived here without someone inviting you, click the link below. Fill out the form on the next page and we'll connect you with a church in your area which teaches and practices these things. Finally, click the link below to add yourself to our mailing list. Fill out the form and check the appropriate box. From time to time, I update this series and add new lessons. The only way you will know about new lessons is through our email updates. Well, thanks for watching. God bless you in your efforts to seek God's will for your life. Dig into the scriptures. Always seek the truth, no matter where it might take you. Keep a humble, child-like heart and let us always be open to the possibility that we could be wrong. Now, what are you waiting for? Get up, make that contact and learn the rest of the details about the amazing Biblical Plan of Salvation. Step out in faith... a faith that obeys.